Igloo, the industry leader in cooler manufacturing, today announced a new line of eco-friendly back-to-school (BTS) lunch coolers made partially from recycled materials. In addition to using recycled polyethylene (RPET) for the outer material, the line features leak-resistant, antimicrobial liners that are easy to clean, PVC-free and BPA-free food safe materials, and thick insulation to keep lunches cooler longer. The Recool BTS lunch collection is designed using recycled materials in earthy, cool, and aspirational patterns and colors for eco-minded kids, that also maintains the high quality standards and food safe materials parent’s look for. 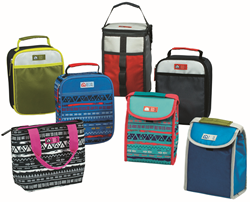 Igloo Products Corp.(“Igloo” or “the Company”), the industry leader in cooler manufacturing, today announced a new line of eco-friendly back-to-school (BTS) lunch coolers made partially from recycled materials. Igloo product manager Melissa Poole said the Recool line was designed to help children and their parents keep up with the increased pressure from schools and students to embrace “green” initiatives. “Children not only care more about the environment than ever before, but they are becoming the main advocates and influencers of “eco-mindedness” within their families,” Poole explained. In a 2014 parental survey, 62 percent of participants said their kids are motivated to recycle at home, and 50 percent say their kids educate the rest of the family on recycling. The Recool line is divided into two collections—Geo Sketch (Melon, Denim and Slate) and Solids (Cayenne, Ocean, Moss and Coal)—each with three bag shapes. In addition to using recycled polyethylene (RPET) for the outer material, the line features leak-resistant, antimicrobial liners that are easy to clean, PVC-free and BPA-free food safe materials, and thick insulation to keep lunches cooler longer. Recool will be available at retail starting in June 2015 with MSRP’s ranging from $7.99 to $10.99. Recool is Igloo’s second product line to feature recycled polyethylene (RPET)—the first being a collection of reusable grocery totes called Igloo Market.